Chapter One: Starts off with Kyoshiro still battling against Nobunaga, and is unbelievably calm in battle. The onlookers also see how he is able to use the same sword techniques as Kyo, such as the Mumyoujinburyuu. Kyou seems to have the upper hand at the end of the chapter. Chapter Two: Kyoshiro hesitates in killing off Nobunaga, overcome by a flood of flashbacks. Kyo's spirit urges him to do it, and Kyoshiro is ripped apart by the internal struggle of two spirits in his mind. Just as Nobunaga takes this opportunity to kill off Kyoshiro/Kyo, the Gate of Hell opens and Akira appears!! He reveals that he is in possession of both Kyo's body, as well as Shiina Yuya's life (soul)! Chapter Three: Akira gives a gun which belonged to Yuya-san to Kyoshiro, and Kyoshiro lashes out. When Akira reveals the bloody (and NAKED) body of Yuya-san, Kyoshiro flips out, despite the fact that he should've spent all of his energy fighting with Nobunaga. It looks like Kyo's spirit takes over as he faces off with Akira, as Akira tells the bitter tale of his past: Kyo found Akira as a child after destroying his village, and offers to take him in and make him the SECOND strongest man in the world. Nobunaga jumps in to kill Akira, but is frozen with Akira's freezing powers. Shindara interrupts to introduce...Yuya-san! She's alive and walking out of the Gate. Chapter Four: Yuya-san's fine and we find out that she aided Shindara in escaping from Akira's ice trap. When Kyoshiro confronts Akira about his lying before, Akira says that he just wants to make him suffer and that Yuya-san is his obvious weak point. He then disappears into thin air, and tells them that if they can find him, he'll give back Kyo's body. Then, Kyo and Nobunaga get back into their fight, determined to finish it once and for all. Chapter Five: Nobunaga is the loser and his head blows off. Before anyone can come and check on Kyo they find that they can't move their bodies, thanks to...Kotarou, an accomplice of Shindara. Everyone starts to leave the scene of the bloody battle when Yuki's brother, Nobuyuki, shows up to say hi. But BAM, they notice that Nobunaga's head is gone!! We find that Shindara has taken it and is bringing it to "Shatora" who has been waiting a long time for it, in order to revive Nobunaga. Chapter Six: Bath scene of Yuya-san thinking over the past battle and events. The Gate of Hell apparently won't open again, and she feels guilty for causing so much trouble for Kyoshiro (getting caught, helping the bad guys, etc). Previously, Akira had proposed to Yuya to come with him and "be his woman" but she refused. She's also worried and afraid about how Kyoshiro killed her brother. Now Kyo and all his buddies decide to go and find Akira! Chapter Seven: Chapter opens with Okuni telling Yuya that she might want to consider killing Kyo to get revenge on her murdered brother, but Yuya is confident that Kyoshiro will return to his normal self. Nobuyuki leaves for Edo, but Yukimura discovers it's only under Ieyasu-sama (Tanuki)'s orders, that he came in the first place. And also that, if they had lost against Nobunaga, Ieyasu probably would've had them all wiped out. In that army of 20,000 men, there are two specific people that they should look out for, Nobunaga warns. Just as Nobuyuki leaves, Shindara shows up to talk with Yukimura. 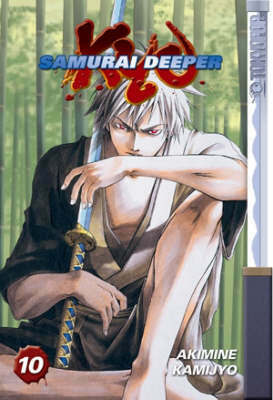 Yukimura reveals that he used to go by the name "Sarutobi Sasuke". Chapter Eight: Shindara reveals the "Guren Joudo'"s plan to resurrect Nobunaga, as well as to wipe out Kyoshiro. Kyo threatens that when he gets his body back, he's gonna kill all of Shindara's people out. With that, Shindara leaves, and Yukimura revelas to the others that he was never fighting alongside them as a friend, but simply because he feels that Kyo can serve as some benefit to him. He then tells them that Akira is hiding Kyo's body in the royal castle in the capital! And they all head out for it! Chapter Nine: The troupe's camping out in the forest. Nothing much except that Sasuke's a bit peeved thinking how Shindara's stronger than him and whatnot. Toro tries to get a peek into the girls bathing. Bontenmaru shows up, and he's also off to the capital to kill Ieyasu and become the next ruler.